I’m usually a sucker for anything new, exotic and improbable, so I was delighted to learn about Jimmy Nardello Sweet Italian Frying Peppers. Named for the seed saver who preserved the peppers’ stock—the son of Italian immigrants who brought them to the States—Jimmy Nardello Peppers are long, often twisted, heirloom peppers that range from a greenish yellow to a deep red. I acquired my first haul of peppers from Good Hummus at the Wednesday Farmers’ Market, then realized I wanted more and picked up a handful grown by Full Belly Farm, from the Davis Co-Op. Those from Full Belly were smaller and lighter in color than the ones from Good Hummus. I was assured by one of the Good Hummus people that while they are traditionally frying peppers, Jimmy Nardellos are even better when brushed with olive oil and roasted. I decided to split the difference by first sautÃ©ing them in garlic and olive oil, then broiling them. I also decided to stuff them with a marscarpone cheese filling. I fried the peppers in two batches, flipping them periodically until their skins were blistered and charred in some cases, then removed them to a cutting board. While the peppers cooked, my dinner guests helped by mixing marscarpone, parmigiano reggiano and some toasted bread crumbs together to make the cheese filling. I sliced the side of each pepper, then filled them with a few tablespoons of the marscarpone mixture. Then I stuck them in the oven (set to broil), on the middle rack. 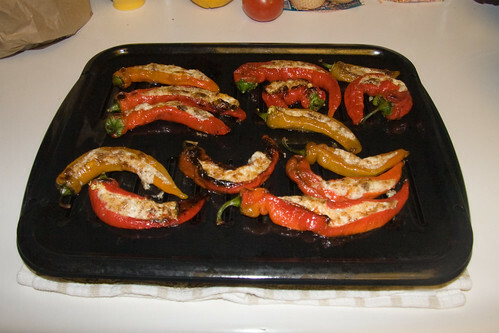 The peppers cooked for about 10 minutes, until they were lightly charred on top and the cheese mixture was golden. We enjoyed the peppers over couscous. The cheese mixture was lightly sweet with a little crunch, an excellent compliment to the soft sweet flesh of the peppers and their lightly caramelized skins. Heat the olive oil in a large pan. Add crushed garlic and cook until garlic begins to brown. 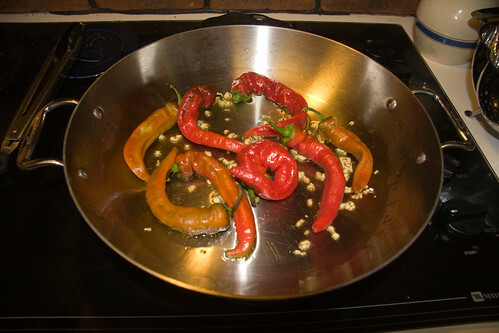 Add whole peppers to pan and cook, turning occasionally, until the skins begin to pucker and char. 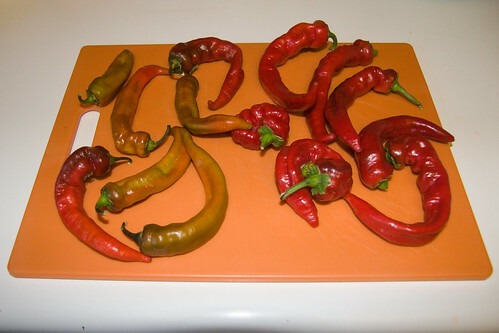 Remove peppers from heat and let cool. 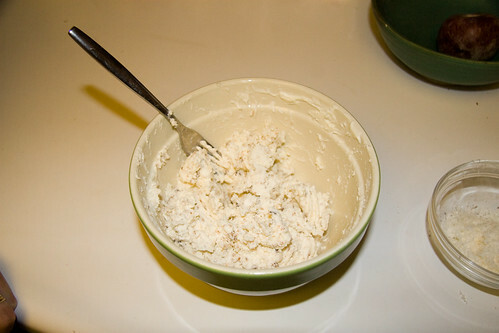 Mix marscarpone, parmigiano reggiano and breadcrumbs in a small bowl. 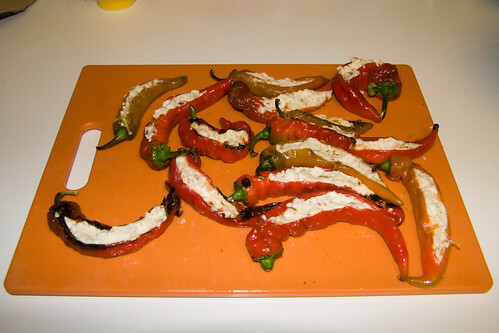 Make slits in one side of each pepper, then fill peppers with 2 tablespoons of cheese mixture. Broil in center of oven for 10 minutes, or until skins start to blacken and exposed cheese is golden.